Adam Oxford visits the township school that is achieving astonishing results, and showing others how to follow in its path. Well over 85% of its students pass their matric every year, and in 2014 it boasted the best-performing student in all of Gauteng’s public schools (becoming the first no-fee school to do so). Last year no fewer than 66 students got distinctions, and all of the current learners here use tablets to access lesson materials – many have gone on to successful careers in IT. Yet 10 years ago, the Ponelopele Oracle school in Tembisa, on the East Rand, was just a muddy field in a township where access to education was at a premium. As a school it’s highly unusual, not just because of its academic results, but because it’s also a private-public partnership. The school is run by the Gauteng Department of Basic Education (GDBE), but is wholly sponsored by US software giant Oracle. Even its name, Ponelopele, is a rough translation of “oracle” in Sepedi. Through its global CSR arm, the firm paid for its construction and not only maintains a financial interest, but also supplies technical advice and hardware, and allows staff to volunteer as mentors and tutors. Many students from Ponelopele have gone on to work for the firm, thanks to internship programmes it also offers as part of its involvement. Education minister Angie Motshekga, who, as an MEC for the GDBE, was responsible for setting up the project, recently visited the school for its 10th anniversary, praising it as “one of our greatest projects in the country”. Given the confidence it has brought to the community who use it and the opportunities it has created for its students, it’s hard to argue. Its resources, Motshekga says, “help to liberate African children”. When the GDBE embarked on a project to modernise classrooms with tablets and smartboards in every secondary school in the province, three years ago, part of the inspiration came from Ponelopele Oracle’s experience. The school was integrated into the initial “paperless classrooms” pilot in 2014, and continues to be a flagship for the province’s programme. 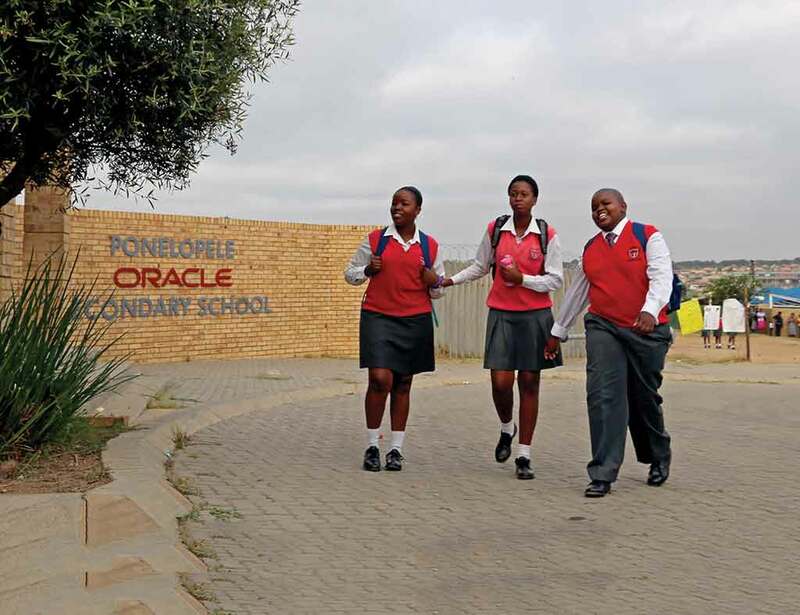 While Ponelopele Oracle is an incredible resource for Tembisa, there’s a hope that an even more lasting legacy will be in the wider education system. Not only did the school help to inspire the Gauteng programme, but during holiday periods it’s used to train teachers in best practices for bringing ICT into the classroom. “It’s an important resource for teacher development,” says GDBE deputy director-general Vuyani Mpofu. English test and made headlines in a story that repeats itself annually. The concern for many is that computer literacy levels among teachers are generally regarded as being low, which could create negative impacts when ICTs are introduced as teaching tools. Without proper training and support, it’s all too easy for teachers and politicians to see ICTs in the classroom as the end goal, rather than a tool to enhance and progress teaching methods themselves. To get it right, it takes more than passing out tablet computers; it’s essential that successful institutions such as Ponelopele Oracle pass on their lessons learned.